Last week while I was getting bored while commuting back from office I stumbled upon an article on LLB about Belum Caves which is the largest and longest cave system open to the public on the Indian subcontinent and it sounded fascinating so I reached out to friends and after a little back and forth 5 of us decided to drive down to the cave for a day trip on Saturday. 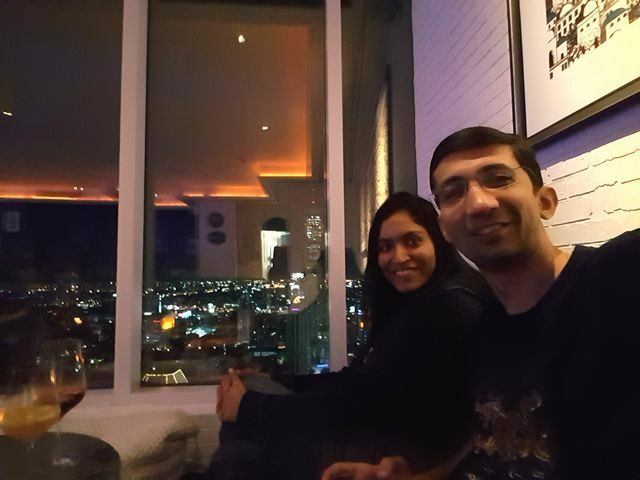 Since we were planning to start from Bangalore at 5am Anirudh, Jani and Shahrukh came over to my place Friday night while Shakshi came over at 4:30am… Hats off to her for waking up so early and making it to my place on time. After a quick breakfast (and a Red bull for me) we left home at 5:15am. The drive was quite nice and since we left so early in the morning the traffic was minimal (which is a minor miracle in BLR). To pass the time we talked about all sorts of random topics from astronomy to the percentage of water in various items like cucumbers, milk and human blood etc. By 7am we all started feeling a bit hungry so we stopped for breakfast and had a road-side picnic and I really mean roadside. We stopped next to some newly planted fields about 2 feet away from the road and had a lovely breakfast of sandwiches, paratha’s and boiled eggs. All we were missing to make this a proper picnic was a picnic basket. After food we were back on the road and made good time to the caves and were there at about 10:40am. 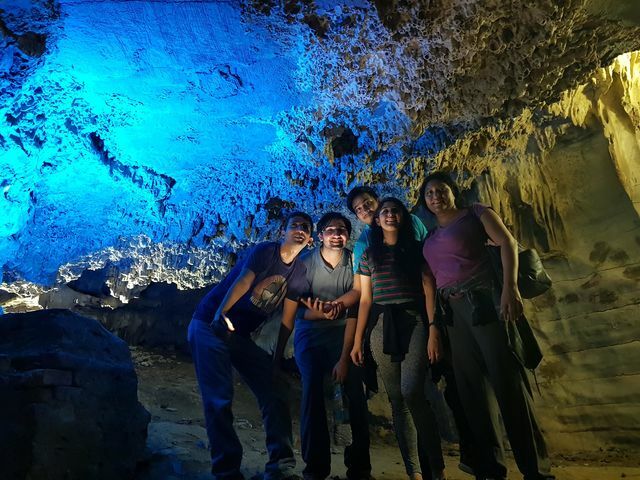 We were one of the first groups into the cave and so were able to explore the caves without having to deal with a lot of crowds. The caves were amazing and I am surprised that not a lot of people know about it. We spent about two hours in the cave and visited all the important/noteworthy parts even though it was very hot and humid in there. Jani was the only one who was comfortable and enjoyed the temperature as her body’s thermostat is broken (She likes hot and humid weather). There were some pretty cool natural carvings/structures in the cave that looked man-made and some man made structures to host camera’s and ventilation ducts that were mostly hidden so we spend a good amount of time trying to identify which of the structures were man made and which were natural. 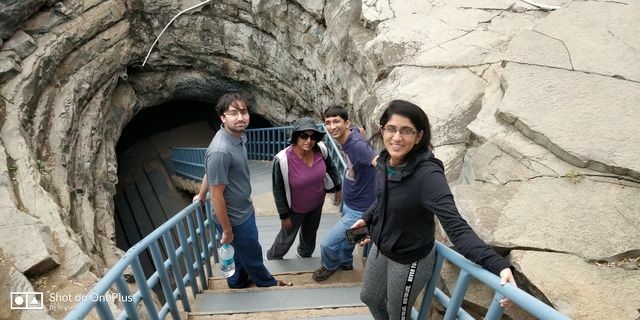 At one point we were ~150 feet underground at Pathala Ganga which is the deepest part of the cave. Here there is an underground water source that looked quite deep and even though we considered pushing one of the group in the water to see how deep it was common-sense prevailed and we decided not to try. 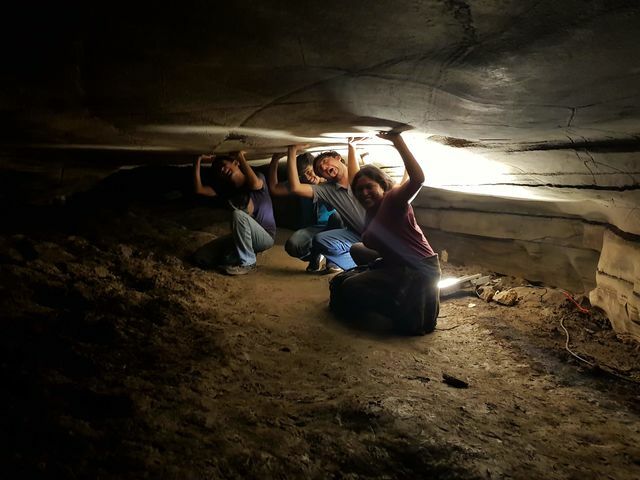 The caves are supposed to have a section that makes musical sounds when struck but we couldn’t find that section. 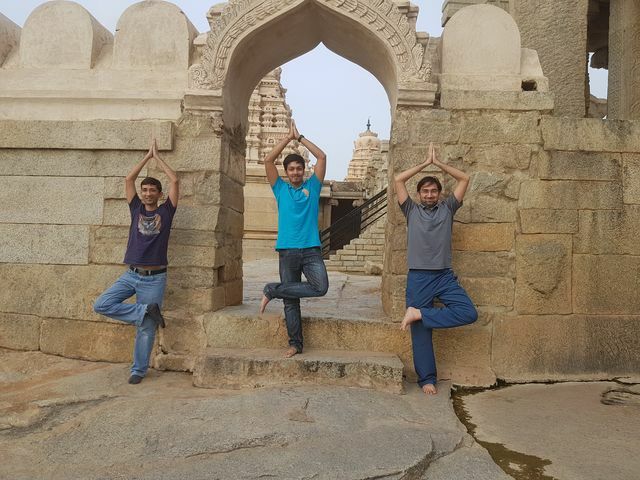 In part it was because we didn’t want to walk around hitting random formations and because we were fascinated by the structures and forgot to search for it. 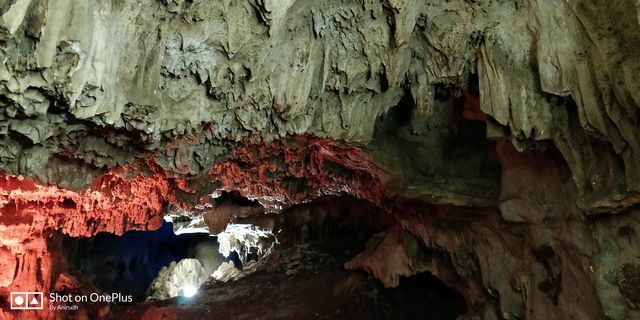 Looking at the structures I was reminded about the Thai cave rescue and it made me think how hard and scary it would have been for them to be stuck in a cave for so long without light. 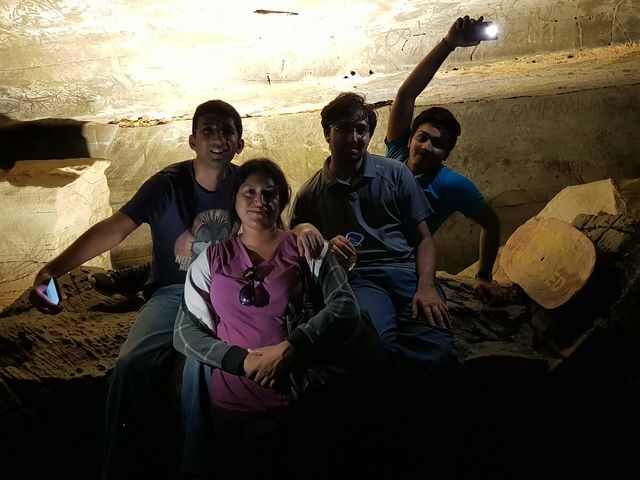 I do want to try cave exploring (spelunking) and have started looking for options in India. After we came out we fooled around on the playground which was quite fun and then had a picnic lunch. 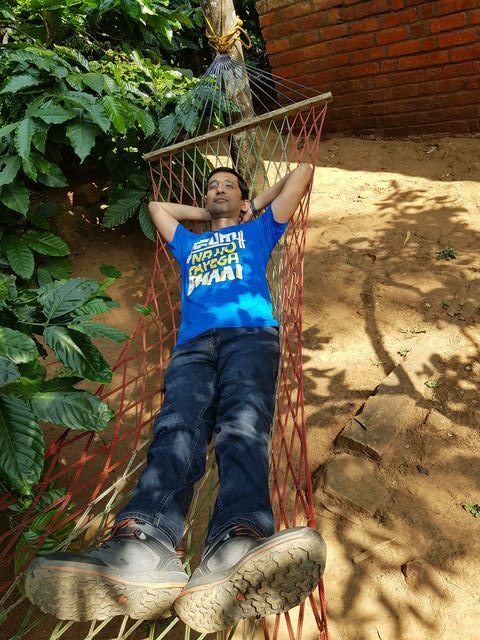 This gave us the opportunity to relax, stretch and enjoy the fresh air. 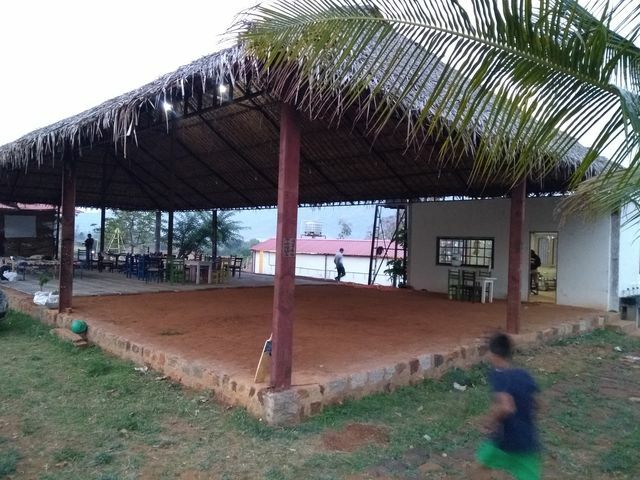 There is a restaurant at the site but has limited options in food. Basically they make about a kg of rice in the morning and if you are early enough you get your food quickly else you have to wait for them to cook the rice. If you are visiting as a big group and are planning to eat there it is advisable to place your order before you head down so that the food is ready by the time you come back from the cave. The temple is beautiful and we spent a good amount of time walking around the premises and enjoying the carvings. Describing the wonders of the temple would require a whole another post so I am going to be a bit lazy and just link to this post over at the RevolvingCompass.com that describes the 7 wonders of the temple. About 1/2 Km from the temple there is a huge statue of Jatayu but we were unable to visit it because of time (it was getting dark and I wanted to minimize night driving on the highway). It was a humbled group that headed back but that didn’t stop our stomachs from rumbling so we stopped for another road-side picnic. This time we found a ready made stone bench for us to use as a table and we made full use of it for a snack break. It was fun to make sandwiches and eat cucumber & tomato with salt and chili. Honestly speaking I could have sat there for another hour but we had to cut the break short because of the time constraints and start back for Bangalore. We made good time to Bangalore and then hit the Bangalore traffic spending a bit over 2 hours to reach home after we entered the city. We finally made it home at ~10:15pm at which point I was ready to crash since I had driven for over 12 hours in the day. But still it was worth the effort and drive. We ended the day with Ice-cream after which everyone went home and I crashed for the night. We will be doing similar day long road trips in the future as it was quite cheap and a lot of fun. The only limitation is the no of people we can take on the trip since I don’t want to have more than 2 cars. More than 10-12 people makes the group unwieldy and encourages the creation of sub-groups. 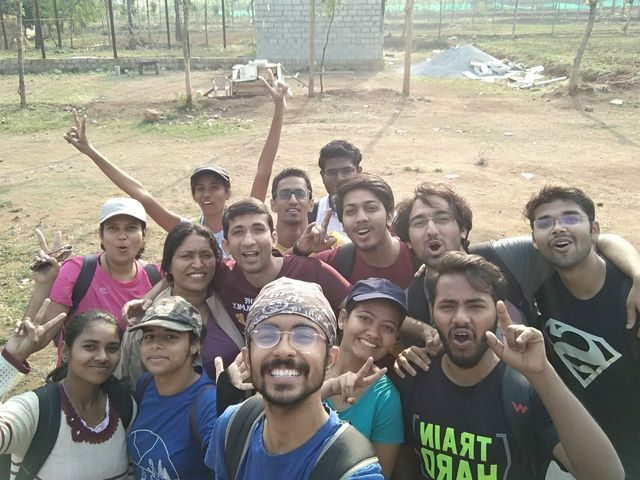 This last weekend I went for my first trek of 2018 to Pyramid Hills which is situated in the Kolegal village near Shivanasamudra. 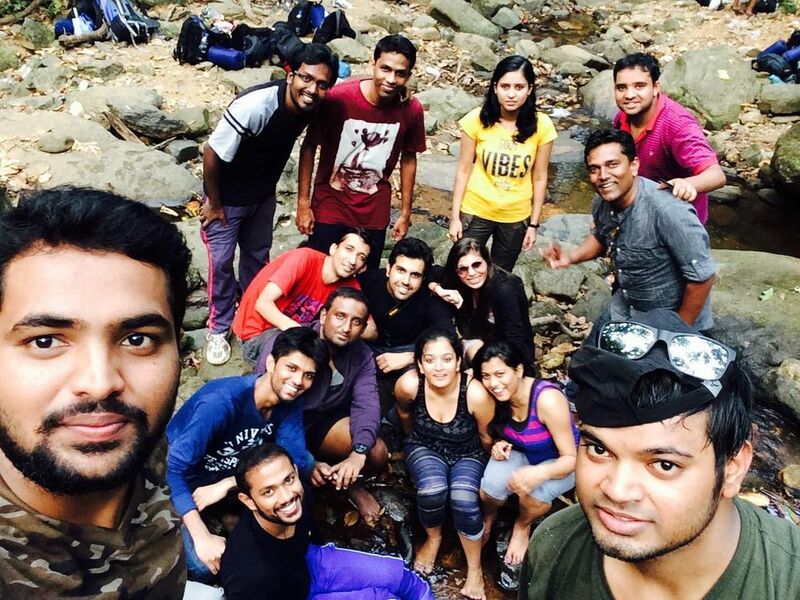 The Trek was organized by Plan the Unplanned and was my first experience with the group. The trek started at 10:30am from Bangalore instead of Friday nights like most of the Treks I have been to in the past which was a bit surprising. Since there were 7 of us friends going for it together and the pickup point was walking distance from my place we decided to have everyone over to my place for breakfast at 9am so that we start the trip on a full stomach. 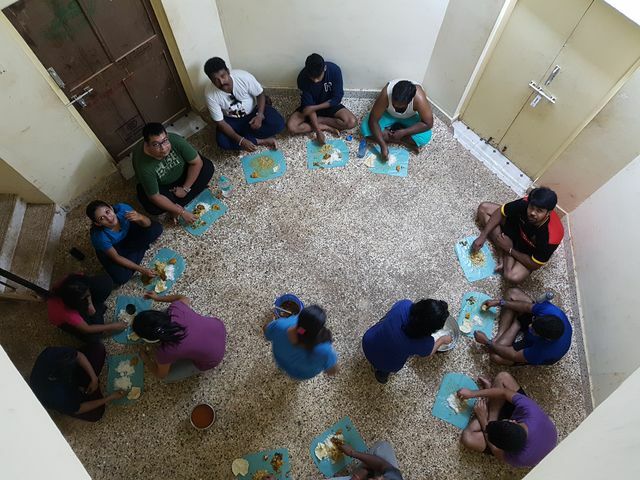 Everyone made to my place on time (yeah I was surprised too…) and we had a filling breakfast of Apple Pie, Eggs, Mattar Paneer and bread before boarding the bus and started the journey into the unknown (or rather to Sivansamudra). Since a lot of us already knew each other, I was expecting the introductions to be a bit boring and repetitive. However I am happy to say that was not the case. The group leaders (Tarun and Aditi) asked us to act out our names or the name of our parent (if we had already introduced ourselves) using dumb charades. It was hilarious to watch folks trying to act out their names and it served as a good ice breaker for the team. The intro followed by an actual game of dumb charades helping us pass the time during the 4 hour drive to reach the base camp. We reached the camp just in time for Lunch and Ratna, the owner of Calver camps had lunch ready for us under an open air setup. As all of us were quite hungry at this time we attacked the food and finished in record time. On a side note, the food on this trip was among the best I have had on treks, usually it is just lemon rice and some snacks but this time it was really good and filling. Post lunch we rested for a little while to allow everyone to recover from the post lunch coma and then started on the first trek of the trip. 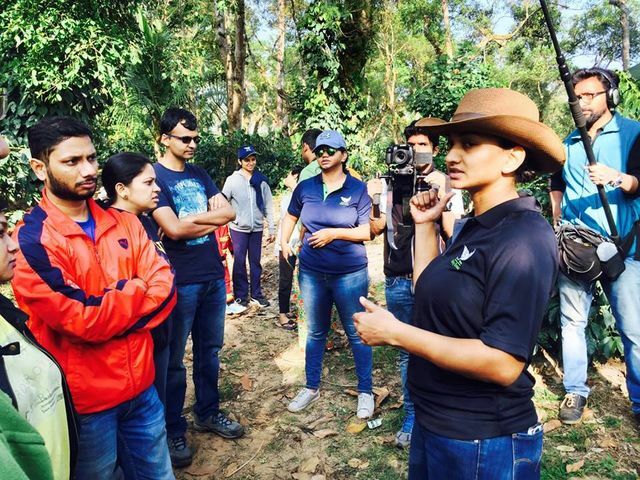 Jani immediately inaugurated the trek by walking into thorny bushes and getting scratched all over. The first part of the trek was through fields that had recently been plowed but there was a clear path through so it was easy walking. 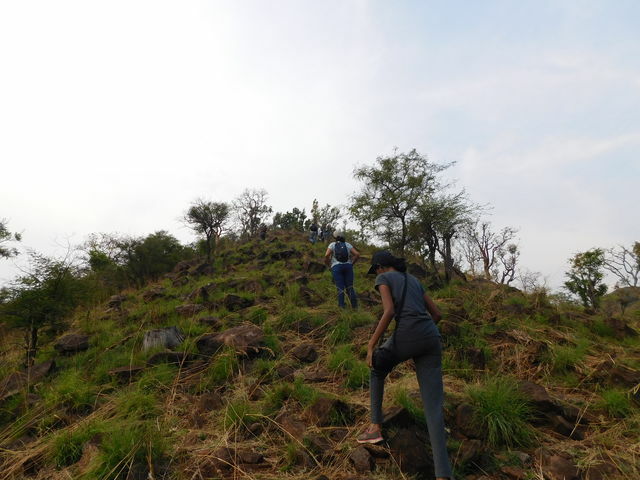 The second part of the trek involved some steep climbing, with parts of it at almost 60 degrees. It was steep enough that none of us had breath to sing like we normally do during the walk. 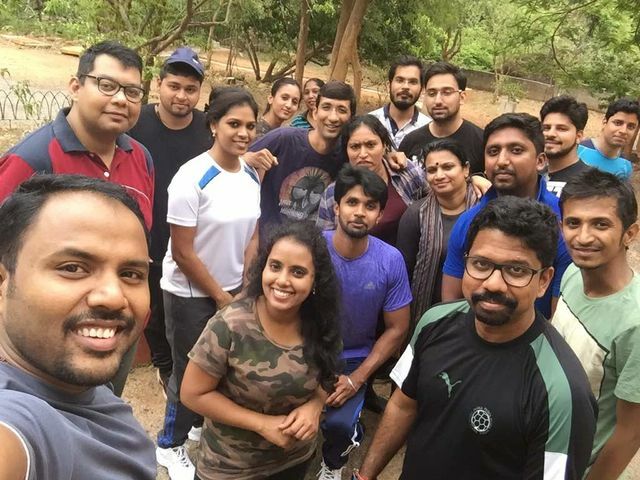 Most of us took it easy except for JD who had a bet with Ratna to reach the top within 23 mins. To all our surprise he actually made it to the top in 23 minutes flat to win the bet. 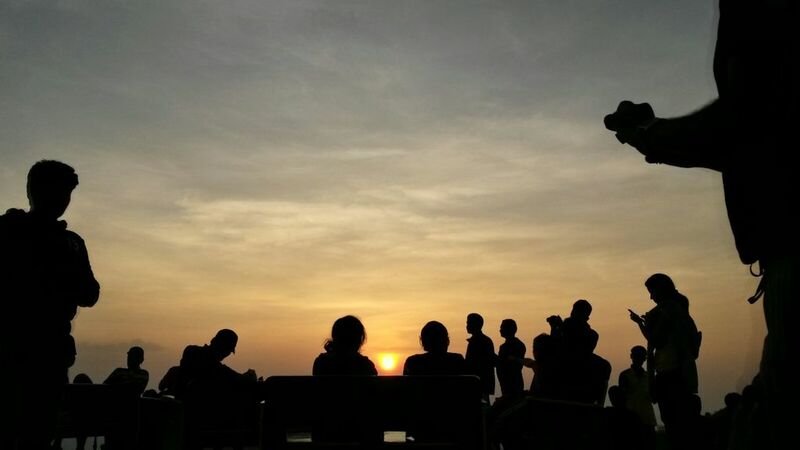 The rest of us took quite a lot longer with frequent breaks but were there in time to watch the sunset. After reaching the top we all relaxed on the rocks for a while, took a whole lot of pics before starting back down. Personally I felt that coming down was easier but not everyone agreed with me as the way down was slippery. At least this time we didn’t have folks having a contest about who would fall most often while coming down. 🙂 By the time we reached the bottom it was dark and we really didn’t have an idea of which way the campsite was supposed to be. So we followed the dog who had accompanied us for the climb, and it took us through a roundabout way but we finally made it back in one piece without falling into a ditch. Once back we all freshened up and then relaxed for a bit playing with the kids. The original plan was to do a bit of star gazing before dinner and a movie but as it was cloudy we couldn’t really see anything except for the moon and that was also mostly covered, so we just fooled around for a bit while Tarun and Aditi tried to get the projector and sound system working for an outdoor movie night. Tarun had brought a good collection of movies to choose from and the majority (or at least the loudest) wanted to watch a horror movie, because that would have been a lot of fun. 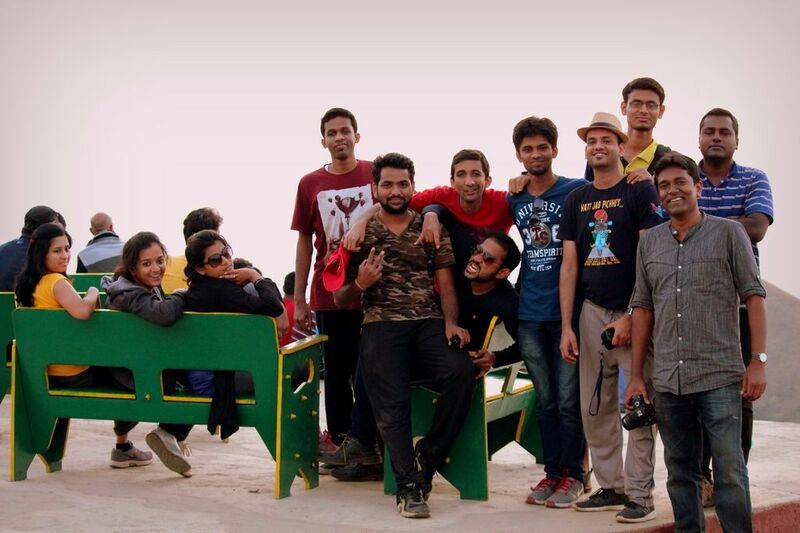 Unfortunately Tarun’s hard-disk’s connector cable died so we only had a choice between two movies and we choose ‘Three Idiots’. This was the first time I have attempted to watch a movie during a trek and to be honest I wasn’t in big favor of it initially but it was quite enjoyable. 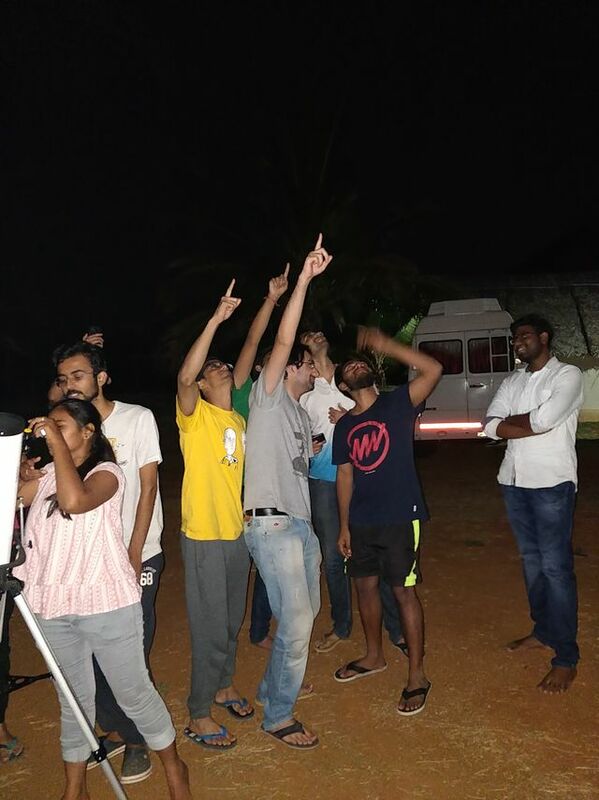 We watched half the movie and then stopped to do a bit of star Gazing as Nikhitha & Mahesh noticed the sky was finally clear enough. Unfortunately we were only able to see the moon clearly as Jupiter was not cooperating in getting focused. We spent quite a lot of time just chatting and watching the stars which they both worked on getting the telescope aligned. 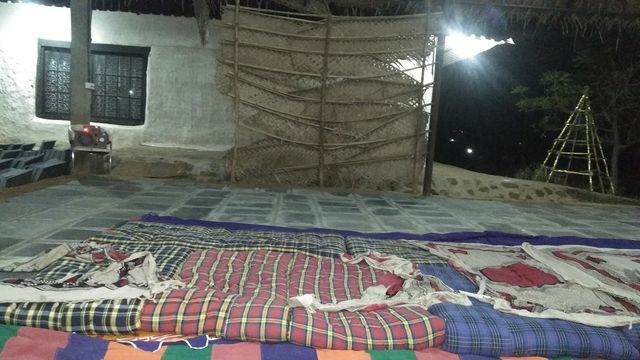 After the star gazing session we all decided to sleep outside in the open itself as the cabins felt a little hot as compared to outside and since there were no mosquitoes choosing between overheating or getting eaten alive wasn’t a concern either. 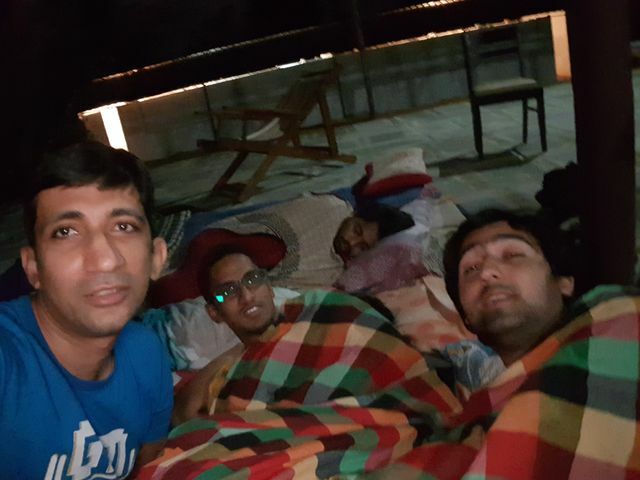 Most of the night was quite comfortable but it got chilly in the morning to the point where 3 of us (Me, Shahrukh and Shashank) ended up sharing a blanket (all of us were too lazy to walk up to the cottage to get another blanket). Sharing a blanket as it was cold! 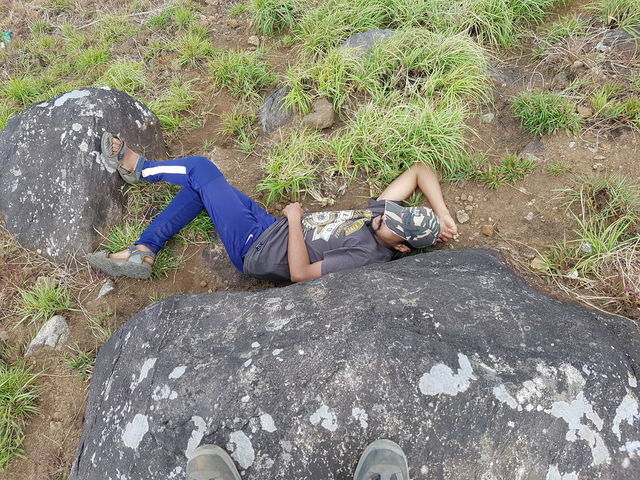 After a heavy breakfast me and Jani spent the morning lazing around the campsite while the rest of the folks attempted the second trek (I had a twisted back). They all survived the trek and came back in one piece in time for lunch which was again quite scrumptious. Post lunch we went ‘fishing’ in a nearby river. Our expectations were that the water was deep enough to swim in so folks who wanted to fish would do so and the rest of us were planning to swim. Unfortunately due to the heat and the fact that the dam upstream hadn’t let out much water that day, the water was only knee deep at the deepest end. 🙁 We still spent some time soaking our feet in the water and tried to get a fish pedicure. In the end we decided to call it a bust and walked back to the bus. While walking back we saw a mango orchard next to the path and decided to pick a few mangoes to snack on. Me, Aditi and Nimisha were picking the mangoes when all three got an electric shock from the fence as it was an electrified fence which we didn’t know when we started picking the mangoes. Thankfully it was a mild shock but still stung. 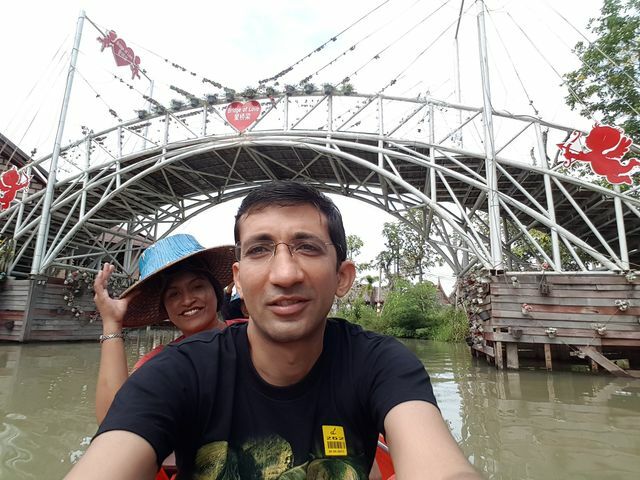 We collected our bounty of 3-4 mangoes and gave up on collecting more and boarded the bus to go for a coracle ride. Since that was on the same river as the fishing spot the water was not inviting enough to tempt us so we had a whole lot of coconut water and then started back to camp to collect our stuff before leaving for Bangalore. Just as we started back to camp it started raining heavily and we enjoyed the cool rain during the drive. Thankfully it stopped raining by the time we got back to camp and we avoided getting drenched while loading our luggage into the bus. The drive back was fairly uneventful and while a lot of the folks slept some of us talked the entire time and I am surprised that none of the folks sleeping threw things at us to shut us up. 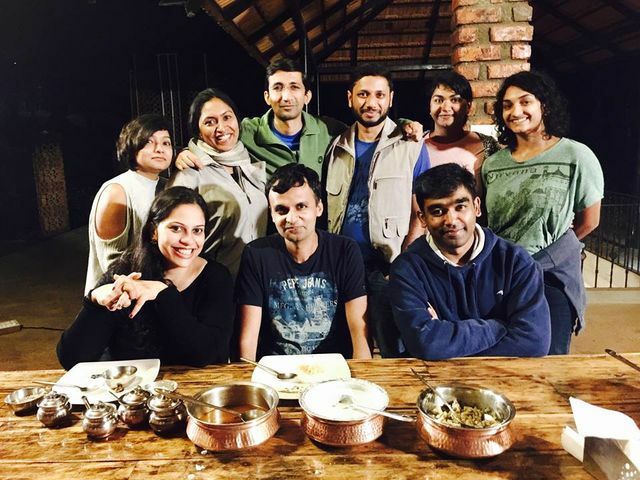 We reached Bangalore by 9:30pm and as we hadn’t had dinner yet and didn’t want the trip to end some of us decided to have dinner together at my place. We picked up food from a restaurant near my place and spent the next few hours chatting away. We would have stayed up longer but everyone had office the next day so we had to call it a night with a heavy heart. I would recommend the trek to anyone who doesn’t mind staying in a place that doesn’t allow smoking and drinking but serves the most amazing and simple food. Just about a month ago I went to Singapore for a 4 day trip and I loved the city. The people were very friendly for the most part and I quite enjoyed my time there. I have been there once before on a disastrous trip back in 2011 where I ended up spending 2 days at the Airport because of issues with a transit visa. Thankfully this trip didn’t have any such problems. We got there early in the morning on Sat and we stayed at the Holiday Inn Express where the rooms were quite tiny. Infact the entire room along with the bathroom would fit into my living room here in India but the stay was quite comfortable and I liked the hotel. The one issue I did have was due to the hotel being an express hotel so they didn’t have an all night restaurant or room service. They did have an all night bar where the only veg option was a Pasta where they literally boiled noodles, soaked the result in olive oil and then added huge chunks of garlic (boiled to tastelessness) and served. I ate that one night and that was more than enough. The first day (Sat) we mainly roamed around near the hotel as we were still a bit jetlagged and feeling lazy. 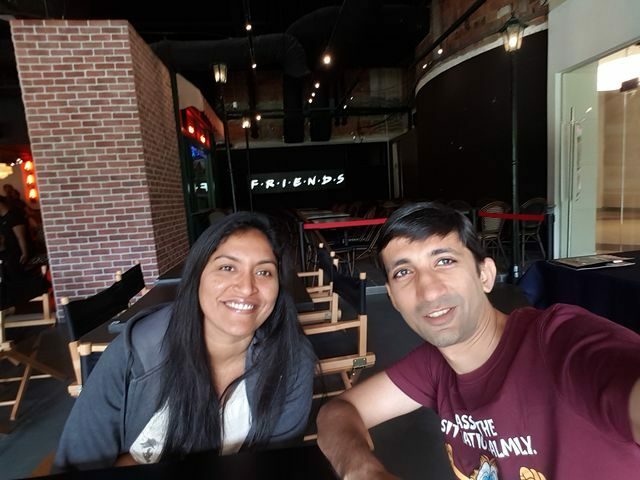 🙂 While walking around we saw this restaurant called Central Perk that looked very familiar and decided to have a late lunch there. It took me a few mins to realize why it looked so familiar and then I realized that the place was a replica of the restaurant from ‘Friends’. It had great food with some of the best fries I have had in all my travels. The portions were huge and it was a struggle to avoid wasting food. In addition to the great ambience the staff was super friendly as well and we spent quite a lot of time eating/relaxing at the place. After lunch we walked over to the China town and shopped for a bit over there. The next day we went to Santosa Island starting with the ‘Butterfly Park & Insect Kingdom‘. 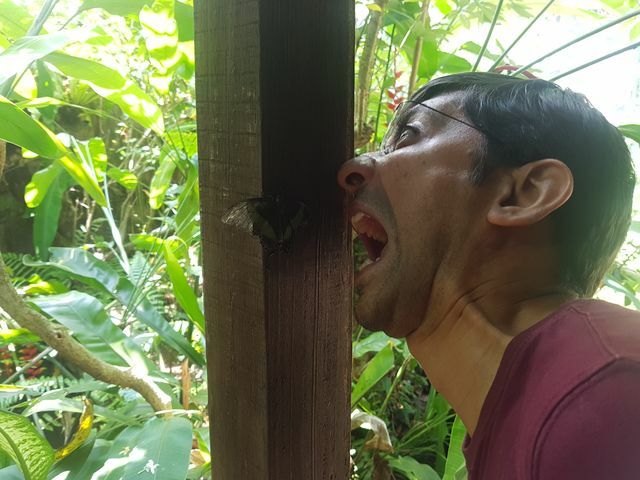 It was an eye opening experience to see all the different species of butterflies in one place because we don’t normally think about there being so many types of butterflies in the world. 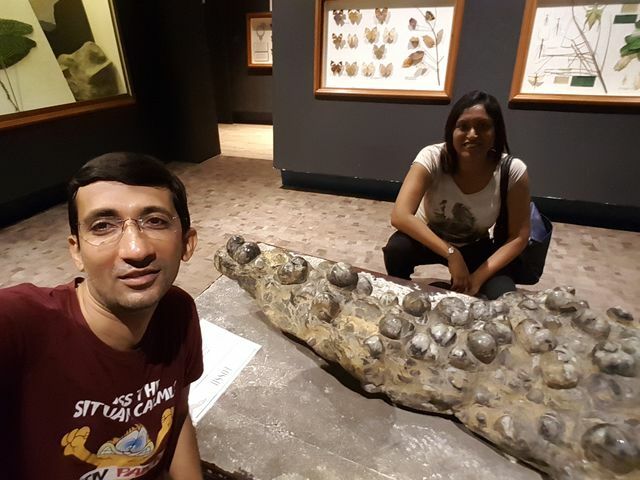 It also had a section dedicated to the insect kingdom but I didn’t really find that part as interesting except for the 370 million year old fossil they had on display. Next we tried out the Megazip and Megazip Adventure line where you zip over forests and beaches at a height of 75 meters traveling at speeds upto 60kph for almost half a kilometer. They have 3 lines running in parallel so you get to race your friends down to the beach. We also did the Mega jump which is a 15 mtr jump from the top of the tower but I didn’t find that as exciting as the zip line. We walked around quite a bit as we had to wait till 7:40pm for the ‘Wings of time’ show. At first I was annoyed that we had to wait for so long but it did give us enough time to walk around the entire island and check out all the attractions. We ended up sitting at a beach side restaurant for a drink because we were tired of walking around and had time to kill and saw a really picturesque sunset. Finally it was time for the show and it was worth the wait. The way they projected the show on spray’s of water was very different and innovative. After the show we took the cable car back to the main island and then the subway back to the hotel. 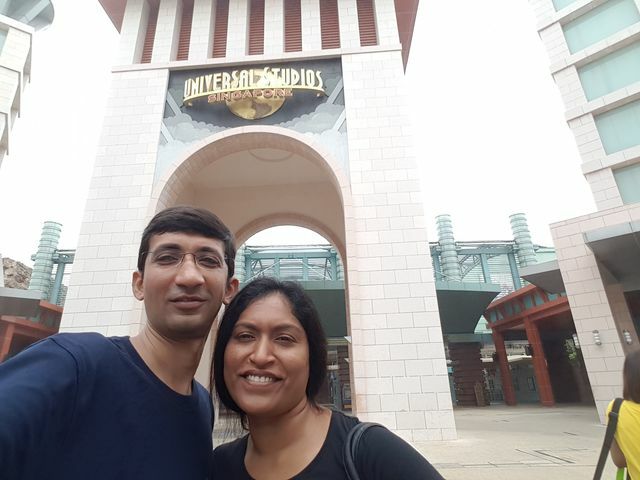 We spent the whole of Monday at Universal Studio’s and as expected it was awesome. I loved the rides and could have spent another day over there. The Transformers and Cylon rides were the most fun for me but Jani wasn’t a big fan of the roller coasters so she didn’t enjoy them that much. By the time the park closed we had tried out pretty much all the rides and loved it. After the place closed we had dinner and went on for the night safari at the zoo. It was a different experience but I didn’t like it that much. Possibly because I am not a big fan of animals locked up in a zoo (even in one without evident bars). This took a while and by the time we were done it was quite late so we headed back to the hotel and crashed. 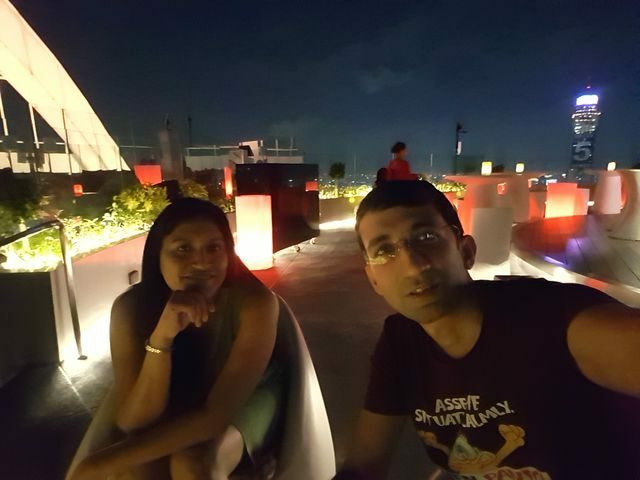 On my final day we moved out from the hotel and checked Jani in to the Marina Bay Sands as she was going to stay back for another 3 days for her conference. The hotel is quite lovely and I wish I had more time to explore all the stuff/places they had in the hotel but I had limited time. 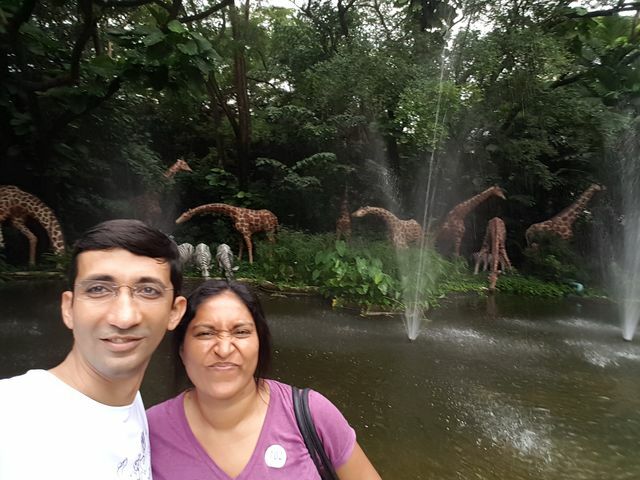 So we decided to check out the Flower Dome and the Cloud Forest instead. I am not that interested in flowers and horticulture but even I was impressed by the sheer variety of the flowers they have managed to cultivate in this area. The Cloud Forest was a whole another experience all together as well, when you walk it the first thing you see is mist followed by a 3 story waterfall. It was nice and chilly inside the domes and I loved it. The dome has some lovely plant life and I got to see a Venus Fly-trap for the first time in their Lost world exhibit. All too soon the trip was at an end and I had to take the cab to the Airport where I had some time to kill and ended up buying a nice klipsch speaker as I needed one quite badly and got a good deal on the speaker as well. Going forward will try to document any trips immediately after the trip ends so that I can do justice to the narrative and experience. This is all for now, will write more later. 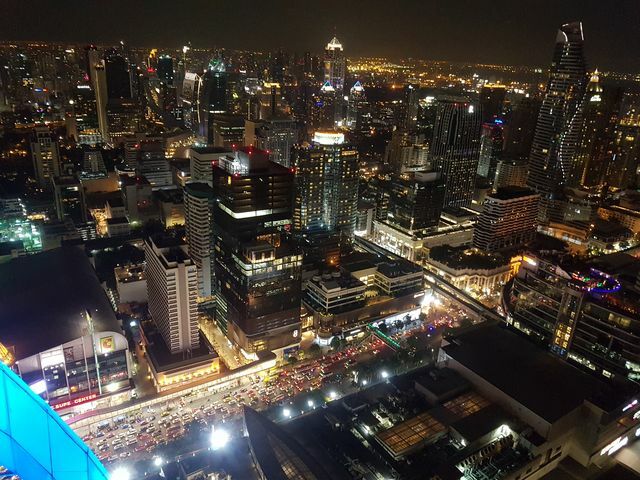 One night (or rather one week) in Bangkok and the world’s your oyster. 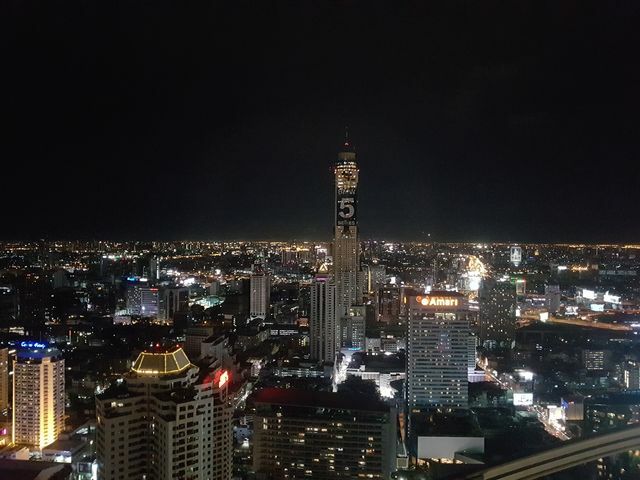 The lyrics of the 1984 song “One Night in Bangkok” by Murray Head perfectly captures the spirit of visiting Bangkok (and Thailand). 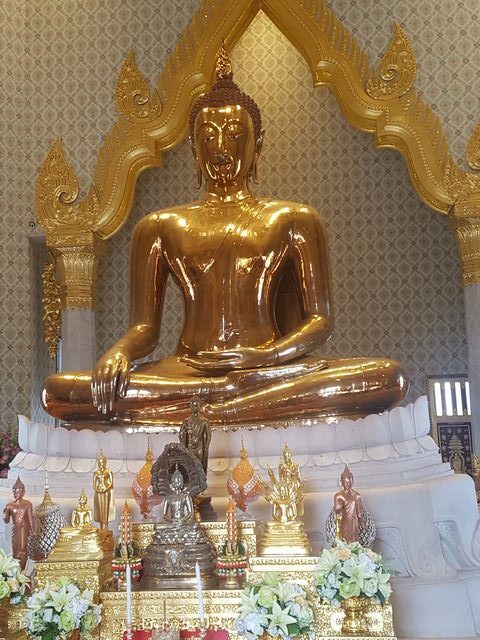 I was lucky enough to visit Thailand and experience it myself a few days ago. I was there for 9 days but was working for 3 days in the middle. 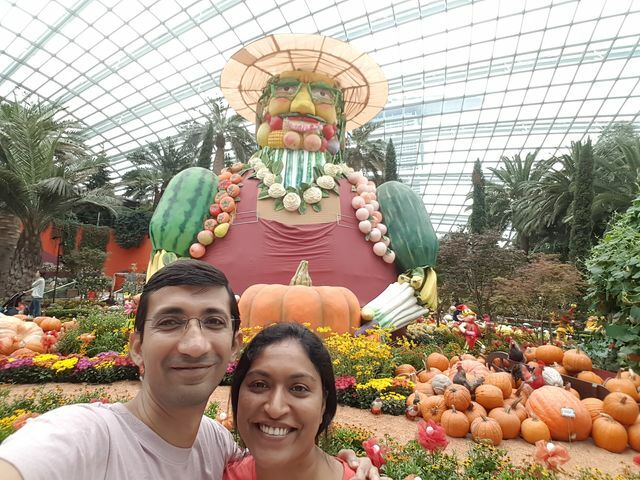 We (Jani and Me) flew out from Bangalore on Saturday morning which in itself was quite exciting. I had to come home from Whitefield to pickup my luggage and then drive to the Airport. For some reason I couldn’t get any cabs from the office at the time so had to book a shared cab instead which went all over the place and I wasn’t sure if I would make it home on time but luckily I did make it back and was there at the Airport in plenty of time to catch the flight. The flight was nothing special so not much to say about it. 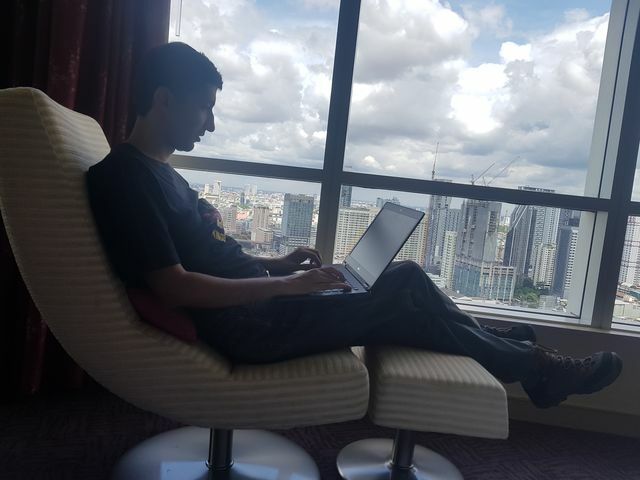 We got to Bangkok early in the morning and since Jani was there for a conference and was a panelist we got the VIP treatment. There was a lady from the conference waiting right outside the flight door and escorted us through the entire process of immigration, baggage pickup etc. Once we collected our luggage there was a car waiting for us to take us to the Marriott Marquis Queen’s Park hotel which was sponsoring a 3D/2N luxury experience for the Panelist (I got to tag along without having to do anything which was great 😉 ). We reached there early in the morning and once we had breakfast we just crashed for a bit since it had been a long few days before the flight. The hotel was great and the facilities were very comfortable. We didn’t do much the first day except walk around the hotel for a bit but the next day we had some fun activities. 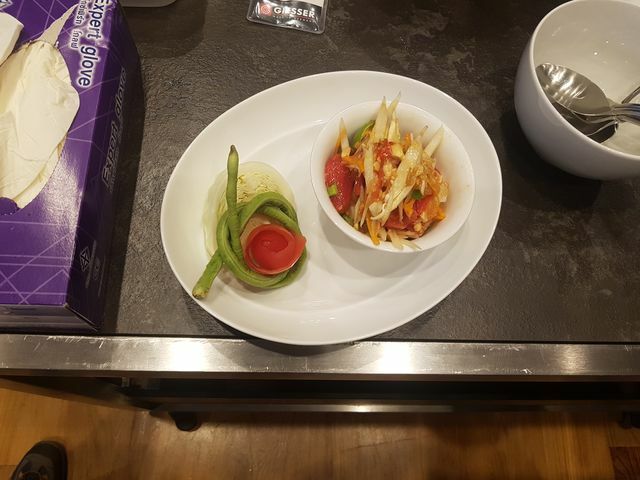 I got to make a traditional Thai dish that I couldn’t sample because it had shrimp/Fish oil in it. However the chef did give me alternate ingredients to use when I got home. I can imagine all of you who know me well shaking their heads at the idea of me cooking something but it was an interesting experience. At lunch since I was the only vegetarian in the group I got served a special meal. I have to say that the staff went out of their way to make sure I had a great experience. 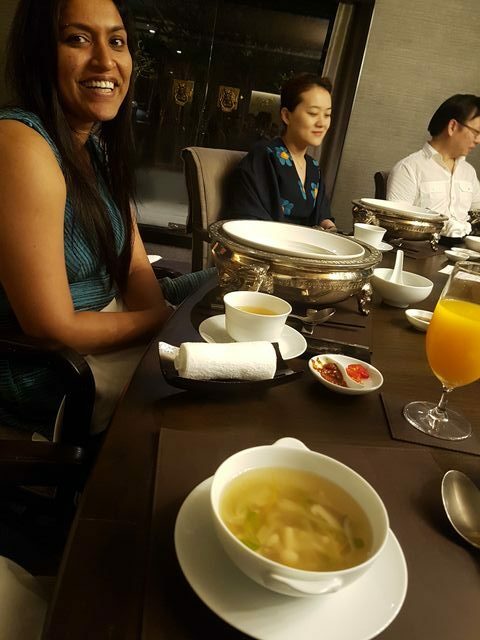 Although there were times when I felt a bit discriminated against as you can see in the photograph below where the white bowl at the bottom of the pic is the bowl in which I was served soup and the big silver dish in front of Jani is what the rest of the folks were served in. On Monday we moved to the Centara Grand and Bangkok Convention Center at Central World which is where the conference was being held. We visited the ‘Uno Mas’ restaurant near the top of the hotel and the views were amazing. Not much happened for the next few days as Jani was busy with the conference and I was busy at work. Below is my ‘office’ during the stay there and as you can see it was an great place to work from. I did consider working from the pool side but that would have been too distracting and too hot to be a feasible option. 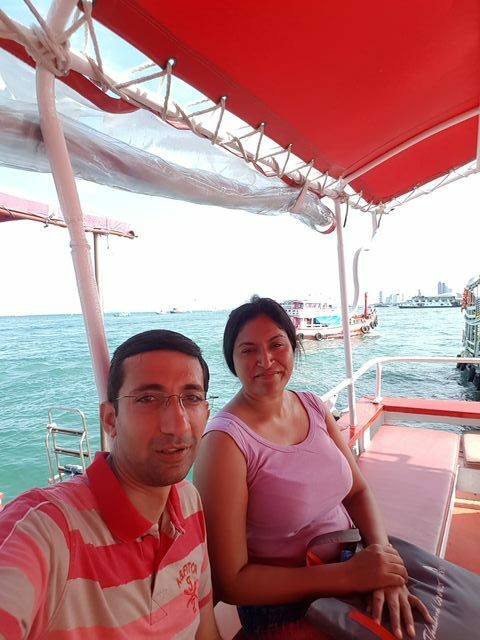 On Friday we took a city tour of Bangkok starting early in the morning which in retrospect was a mistake as Bangkok is a city that is dead during the day for the most part as everyone is sleeping, nights are when the city actually comes alive. 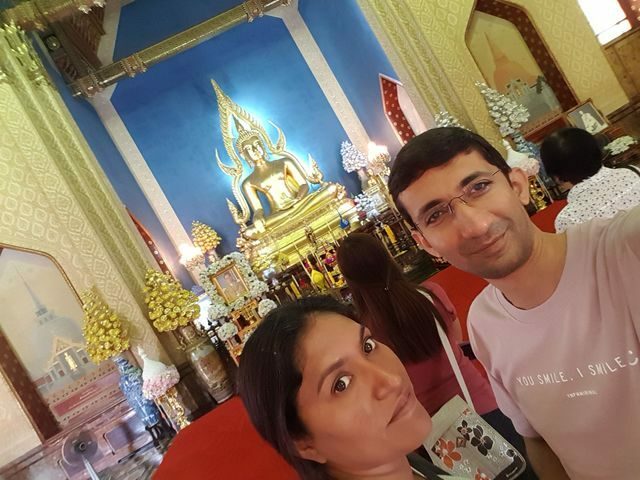 Inspite of that the Golden Buddha temple and the other sites were quite spectacular. Unfortunately since we were a bit strapped for time we didn’t stop at the flower market but rather just drove through it. We did but a few souvenirs but for the most part refrained from shopping. Shortly afterwards we bid farewell to Bangkok to drive over to Pattaya for the remainder of the trip. We got in touch with Sunny from Sunny online Travel who helped us plan out our itinerary for the last few days of the trip. He went above and beyond to suggest things to do and places to see within our budget. Thanks to him we didn’t have to worry a bit about what to do and where to go in Pattaya. If you are in the neighborhood do visit him and he will ensure that you have a great experience at a reasonable cost. To give you an idea of his hospitality he personally picked us up from the hotel and drove us to see the Alcazar Show and then drove us back to the hotel once the show was done. In all my years of travel I can’t remember any other guide doing this without charging a ridiculous price for it. 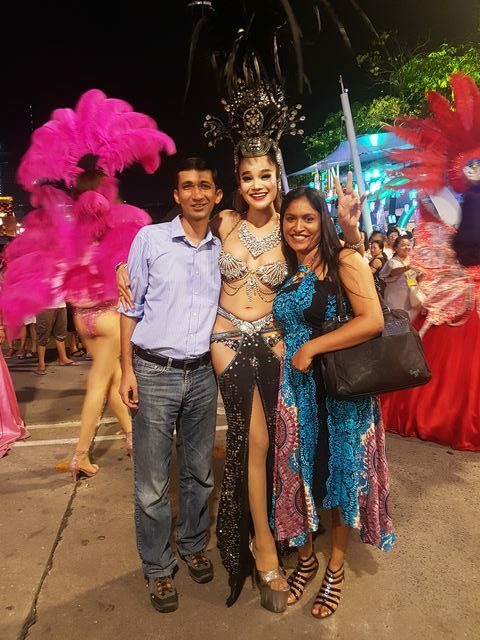 The Alcazar Show was an amazing experience, and I have to be honest that initially I was a bit skeptical about going to a lady boy show but the show was so tastefully done that I was floored by the experience. I wish I could have taken pics with all the staff but that wasn’t possible. But we did manage to get a pic with one of the main stars and she was super nice about it. 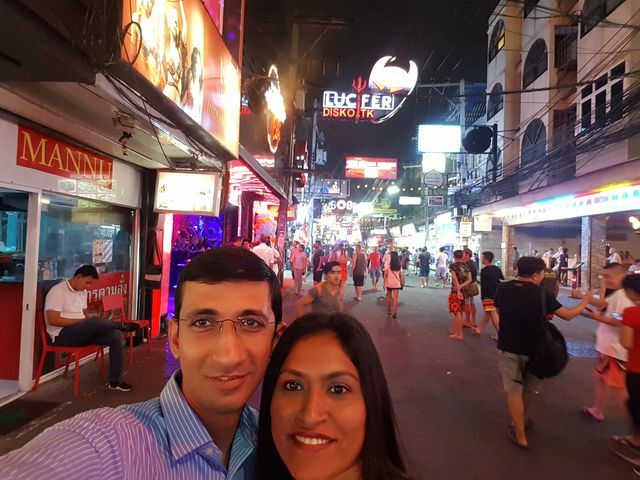 After the show Sunny dropped us at the Walking Street which is one of the biggest and busiest party hotspots in Thailand so that we could explore the nightlife. There was a ton of great pubs/bars/exotic dancers in the street and it was a very different experience for other such party places in the world that I have seen in the past. We walked around for a while and then it looked like it was going to rain so we started walking back to the hotel and just as we were about a third of the way there it started pouring. As Jani always carries an umbrella in her humongous purse we didn’t get too wet but for a while it felt like someone was pouring water on us with a bucket. Once we made it back to the hotel we crashed early as we had a hectic day planned. 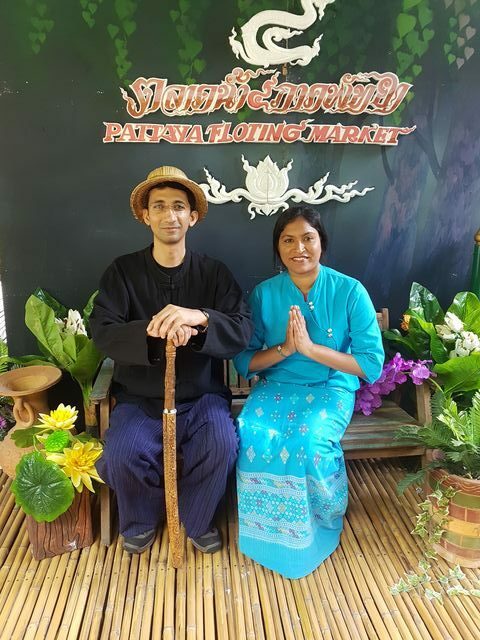 We started the day with a visit to the Floating market of Pattaya where we were one of the first people to get there and the iconic floating shops were still in the process of setting up. In a way it was good because as the place was still starting up there was not much stink and it wasn’t very crowded either. We started of with a canoe ride to the other side of the market where we checked out some cool shops and interesting items for sale. We walked around the whole market and attended a few shows like a monkey show that kept things interesting. They also had a zipline which looked interesting so we did a round on the lines. Due to the fact that we were there early in the day we didn’t have any queues anywhere which was great. After we were done with the market we went over to Nong nooch tropical Botanical garden which was ok, nothing too special. There was an hour long cultural show which honestly felt boring especially after having been to the Alcazar show. The pots and the garden there was quite nice but in my opinion we could have spent that time at the floating market and enjoyed it more. After the exhibit we drove over to Ripley’s Believe it or Not and we did all 7 exhibits. I liked most of them except for Tussaud Wax works which wasn’t too great. The horror rides were great fun though Jani did manage to confuse everyone in the cast by keeping her eyes closed throughout both the haunted ride & haunted house. Unfortunately I listened to her and didn’t get the photo they had taken of us and now regret that decision. Ah well.. The next time I am taking the pics no matter what. This visit concluded our day so we headed back to the hotel and it started raining again… But we weren’t in the mood to do much so we just crashed as the next day we had an even earlier start to go Diving :). The next day we again woke up early to go diving with the nice folks from the Jomtien Dive Center. They picked us up from the hotel and then we sailed for about an hour and half to get to the first diving spot. The water was a bit muddy but we did manage to see some great sea life. Lots of sea urchins and fishes. After the first dive we had lunch and got to our second spot where we dived again, this spot was a lot better with more sea life and corals etc. I did see some sea horses as well which was quite cool. 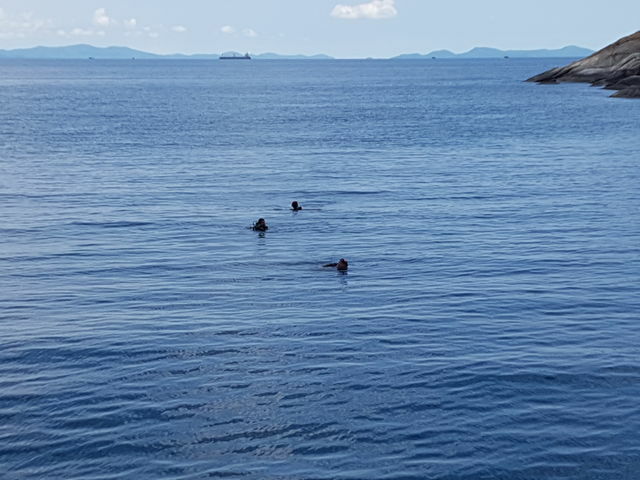 Both dives were approximately 45 mins each (which is the usual length for a recreational dive). The entire thing took us the most part of the day so once we got back to shore we walked about a bit and then called it a night. On our final day in Pattaya we again got up early (which is something I would like to avoid in future trips) and started the drive back to Bangkok. 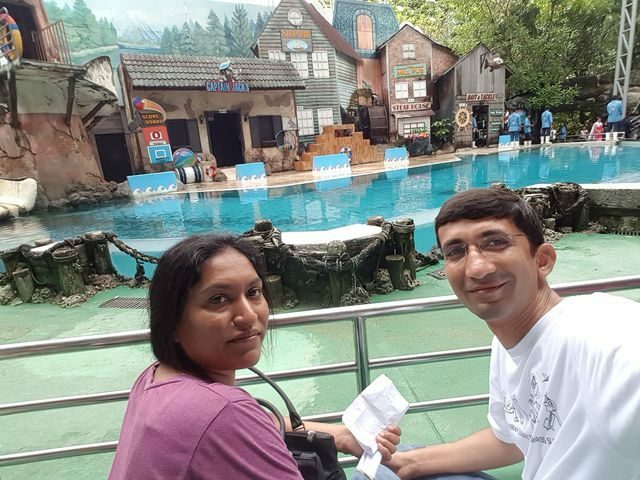 Since our flight back was at night we stopped at the Jungle safari where we spent the entire day walking around in the heat to see the various animals. It was quite fun but I really didn’t like the heat and would have prefered to be in an AC car or something. Still the birds & animals we saw were worth the effort so… There were quite a lot of shows highlighting the various species so it was fun. Once we were done with the safari we drove to the airport and bid adieu to Thailand for a flight back. I would want to go back again for a longer trip so that I can explore the rest of the country but probably will travel to other countries first. I took quite a lot of photos (~600) so I am not going to be posting them, although Jani has posted the highlights on Facebook so if you are interested you can check them out there. I finally finished this post just about a month after I made the trip which is all thanks to Jani for bugging me everyday about the blog. This is all for now, will write more later. PS: In interest of full disclosure just want to let folks know that I am one of the official bloggers for Nature Walkers starting with this trip. 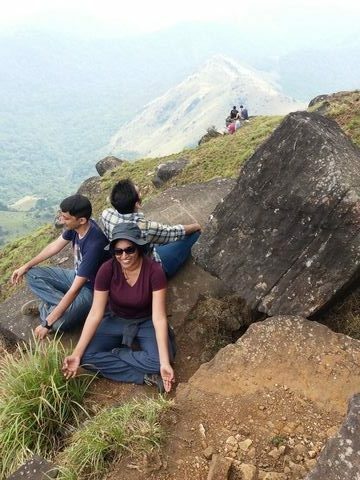 So last weekend I went for my first trek of 2017 with NatureWalkers to this place called Tadiandamol. Don’t ask me to pronounce it because I still can’t manage without sounding silly and it took me 3 attempts to spell it correctly. 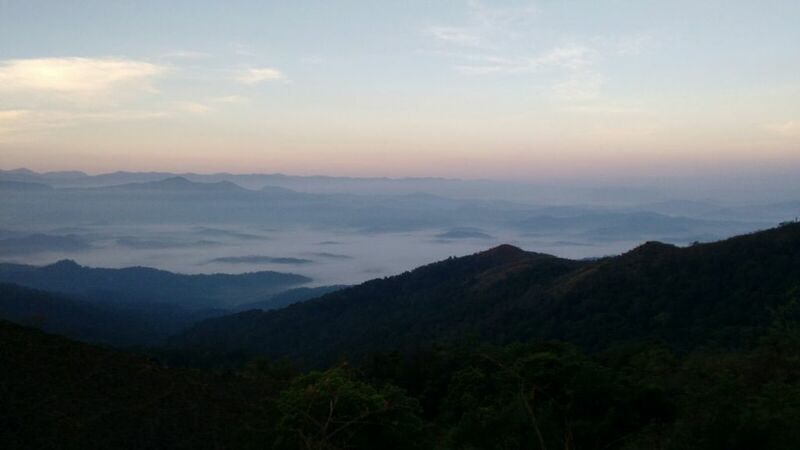 The trek is a total of 8kms long round trip and the peak which is the highest in Coorg is at about 1748 m high. 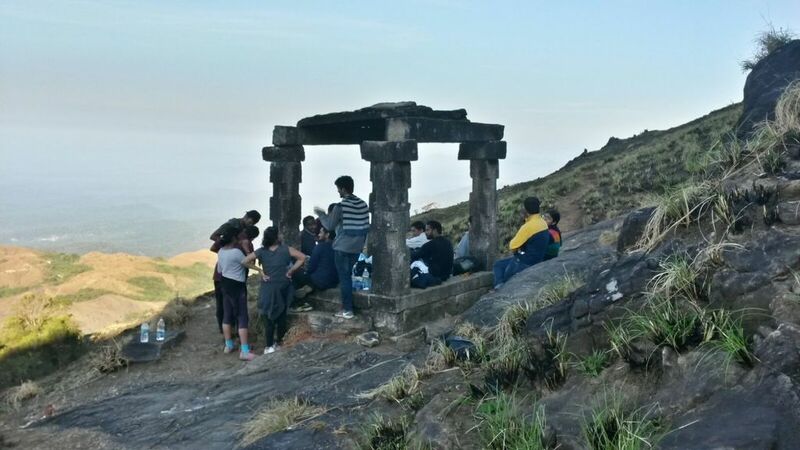 Tadiandamol is on one of the most beautiful, noncommercial peaks in Karnataka, it is elevated to about 1748 m and known as the highest peak in coorg/kodagu district. The Tadiandamol trek offers adventurers an opportunity to explore the stunning vegetation, rare mountain birds and pretty butterflies flitting from tree to tree. A panoramic view from the peaks is an eye-candy for the hikers. 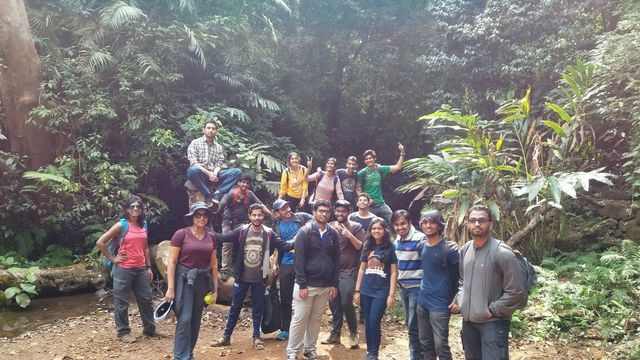 The trial takes you through the vast expanse of the Shola forest, It is a day trek which makes it even more doable for city folks- whether avid trekkers and hikers. A famous historical landmark “Nalknad-Palace” resides at the foothills of the mountain. 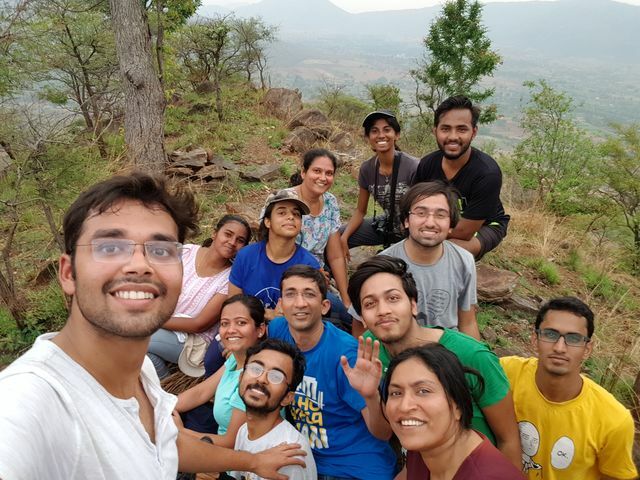 This was my first trek with Nature Walkers and I loved it. 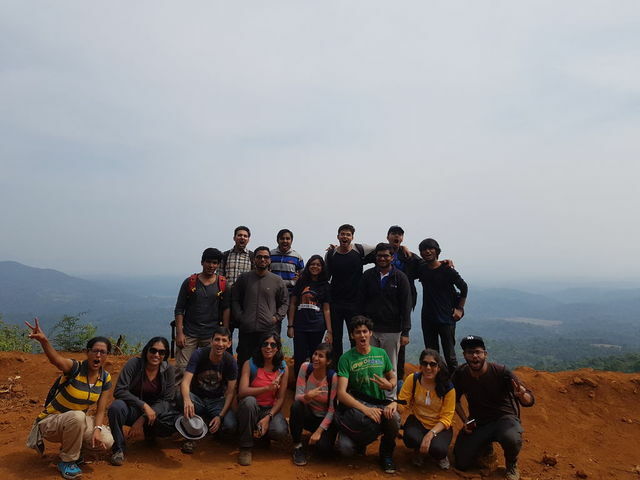 A total of 18 of us were there for the trek with a wide range of trekking experience and age groups. 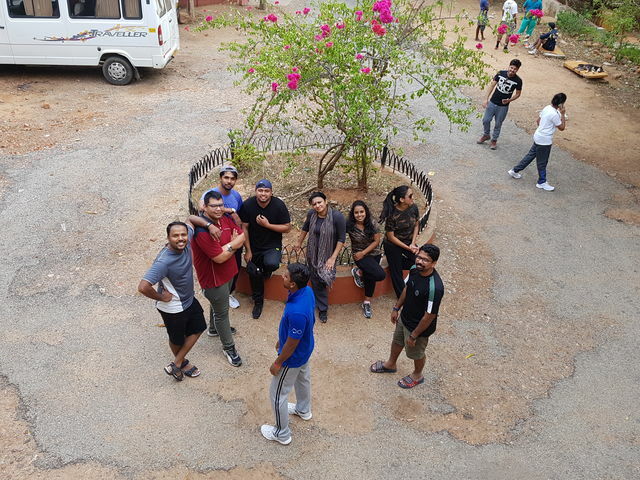 The trip started at 10pm from Bangalore and we boarded the bus after donating a lot of blood to the Domlur mosquitoes (while waiting for the bus to arrive). We kicked off the evening with a round of introductions which included telling folks about something crazy you did and man some of the folks had donbe some crazy stuff (including me 🙂 ) We had people asking their professors to dance, setting fire in the hostel to burn notes and scaring aunts with skulls. After the intro round ended most of the people went to sleep but a few of us weren’t sleepy so we spent majority of the night talking and after a few hours just as we were winding down and I was about to fall asleep the driver switched on the AC at full strength and played some Kannada music at high volume waking me up. So we kind of half dozed while the driver took a nap and then we were on our way again reaching the Homestay at ~7am. We freshened up and then started for the basecamp after breakfast which was about an hour from the homestay. 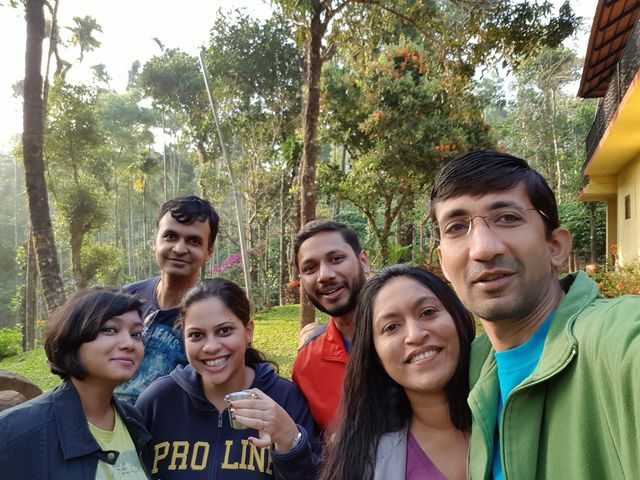 We arrived at the basecamp all bright-eyed & bushy tailed and started the trek on a high note. The start of the trek was fairly easy with a shallow gradient so it wasn’t too painful. Though it was bright and sunny so that made it a bit uncomfortable and soon I was sweating enough that I had to remove the cap. 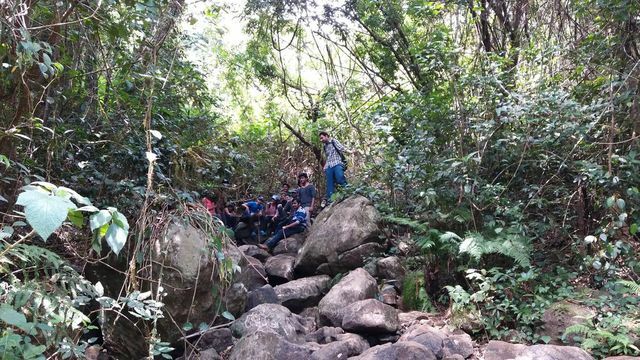 We walked the trek at a fairly slow pace and used the time to talk and learn more about each other, plus take a lot of photos and snapchat videos etc. 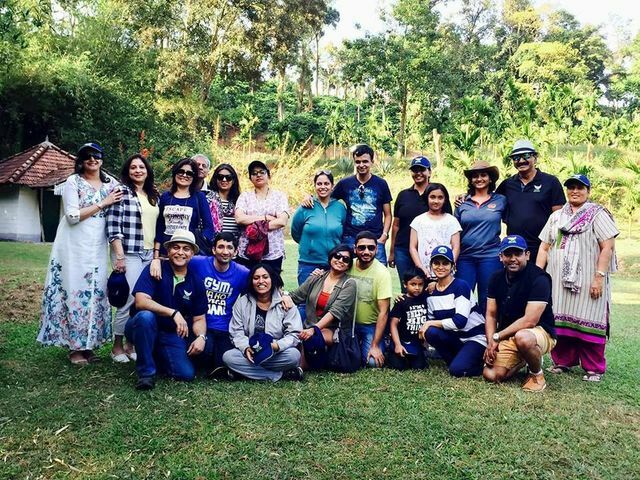 A large part of the group was 12 friends who had come for the trek together and their enthusiasm was infectious. 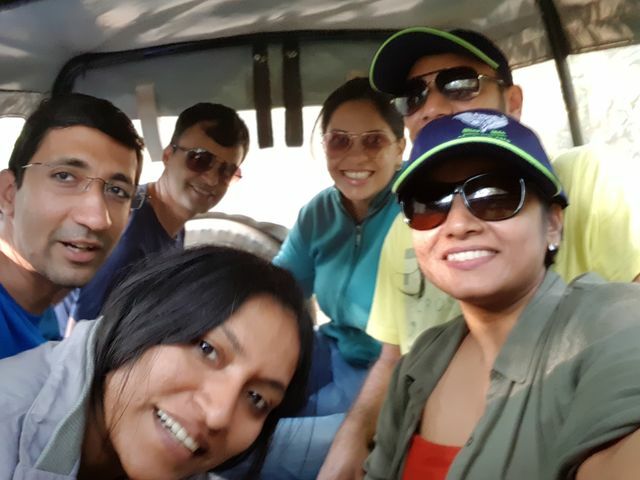 I haven’t downloaded all the pics yet and can’t post all of them in any case so here are a few pics to give you an idea about the trek and the route. The stream was refreshing but with barely enough water to be called a stream. We filled our waterbottels there and I got to use my water purifier to purify the water. 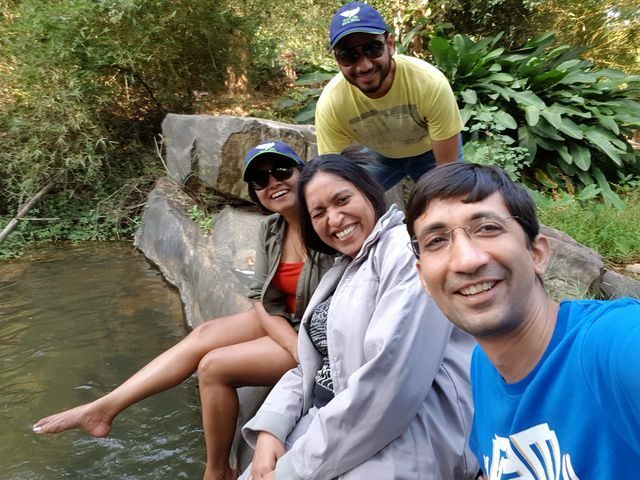 Don’t think it was absolutely required but I needed an excuse to play with my gadgets so… In any case we spent about 15-20 mins fooling around and taking pics before resuming the trek. It took us another 2 hours or so to climb to the top. 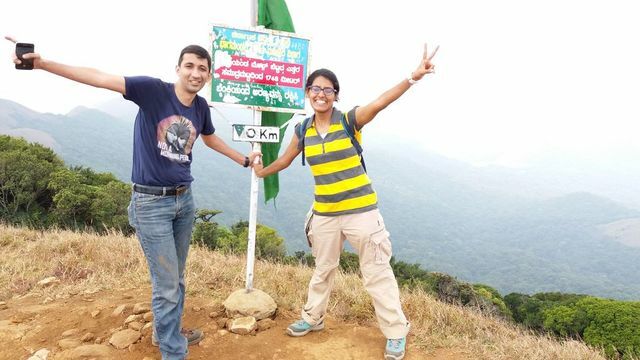 Both Manoj and Amrita ensured that we all were pacing ourselves and constantly provided encouragement so all of us reached the peak together and the view was worth the effort spent to climb to the top. Thankfully it was a little cloudy towards the end of the climb and the breeze was very refreshing as well so that made it a bit easier as well. 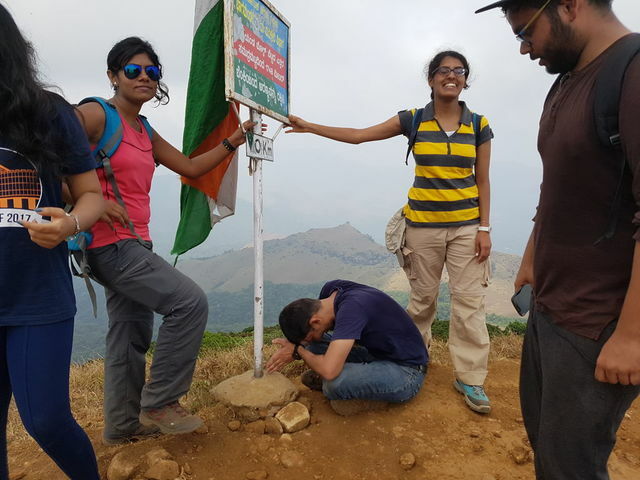 Thanking the gods of the Peak that I made it to the top while Tejaswani and Amrita look on. Once at the top we all took a break to have lunch, meditate and enjoy the view while Manoj took a nap to recover from the stress of herding all of us to the peak. Manoj recovering from herding all of us to the peak. We started back very reluctantly both because we wanted to extend the stay at the top and because our feet hurt 🙂 The way down was more adventurous as the path was quite slippery and everyone fell at-least once though there was a contest going on to see who would fall the most as well with the winner claiming the throne with 8 spectacular falls. By the time we reached the base camp we were all ready to be flat on the ground and not move. But still we ended up dancing for a little while in the bus on the way back to the homestay. Interestingly our bus had a laser/disco light setup which made dancing fun. Although initially it was more of moving hands and pretending to dance than actual dancing. Once we got home and freshened up we sat outside and chatted about topics all over the place from weird food people eat to physics to astronomy and horror stories. The campfire made it cosy enough to sit outside and since we didn’t have any portable speakers we got to show off our singing skills instead of our dancing skills. The jam session continued till almost 1 in the morning and we all dragged ourselves to bed quite reluctantly. Next morning we again made an early start and left the homestay after a lovely breakfast. We were all feeling a bit more energetic after resting over night so we spent a large amount of time playing Mafia which I enjoyed for the first time. The last two times I played the game I found it very boring but with this group it was a lot of fun. I was a cop in the first game and got to play a few turns before getting killed and it was a lot of fun watching the players try to convince each other that they were not mafia. In the second game I was classified as Mafia and was there till the end of the game (We won 🙂 ) but in the last one I was the first person to be killed so didn’t get to play at all. In the middle we stopped at Namdroling Monastery which I have visited a few times before but it was still worth the visit. It is a very peaceful place and since we got there just before the afternoon prayers started we managed to see the temple and then watched the monks start their prayers as well. We did avoid the shopping complex as otherwise we would have been stuck there for hours while the ladies shopped 😉 and were on the way back to Bangalore with brief stops for lunch & tea and lots of dancing. 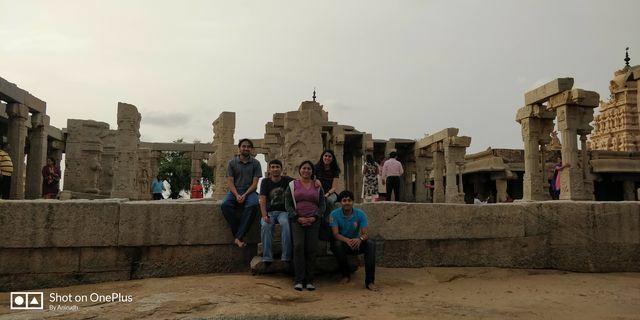 We all enjoyed the trip so much that we didn’t want it to end so most of us got down at Indiranagar for dinner at Copper Chimney instead of heading home directly. The waiter gave us a weird look when the 13 of us were done with just starters and dessert but none of us were very hungry so it was good that we didn’t over-order. 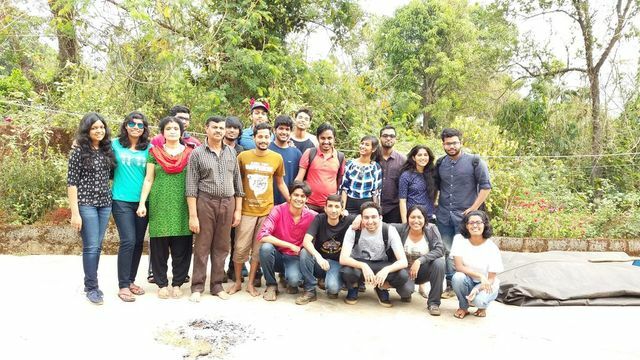 Overall the trip was a great success and I really enjoyed traveling with Nature Walkers. I would highly recommend them to folks looking for a fun well organized trip. PS: For those of you who are wondering about what happened to posting about the previous trips, I realized that the list had gotten long enough that I wouldn’t be able to post about them (15 trips in 2016) and because I was waiting to write about the previous trips I wasn’t posting about the new ones either. So decided to bite the bullet and start with a clean slate. Hopefully this year I will be more consistent with my writing. 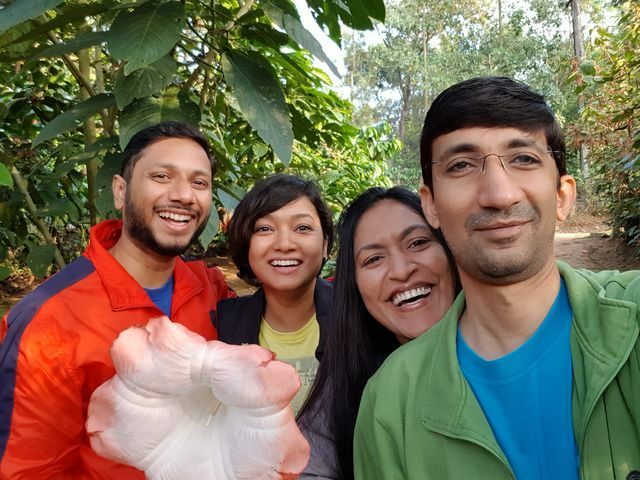 I did the kumara parvatha trek this weekend and it was amazing! 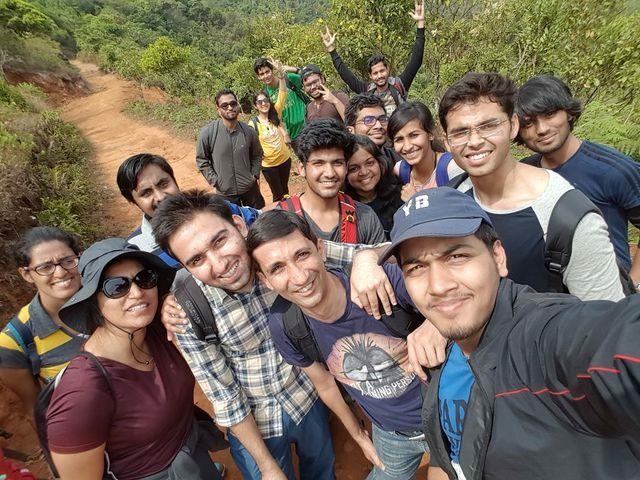 This past weekend I decided to go to Kumara Parvatha for a two day Trek instead of spending it lazing about at home and even though my legs have gone on strike and refuse to work after the trip it was an amazing experience. 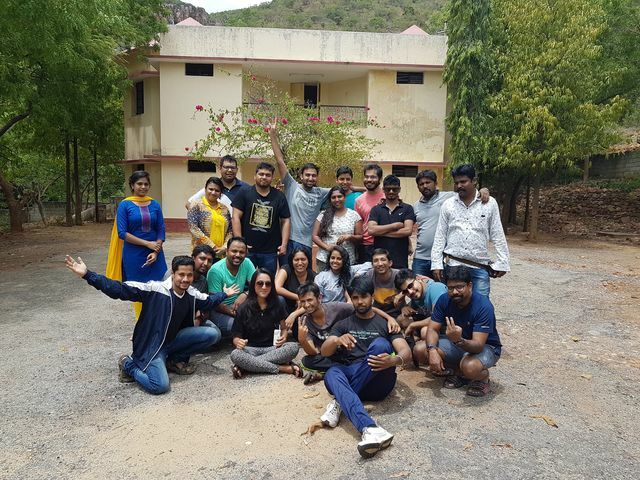 The trip was organized by Shirky as part of the Bangalore Entertainment meetup group. 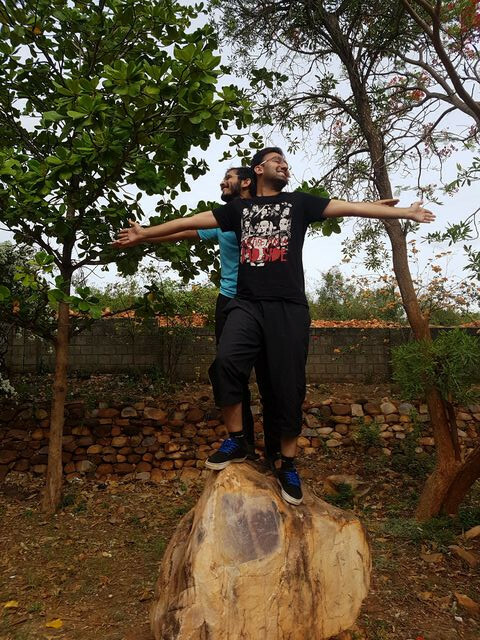 This is the third trip I have done with him as part of the meetup (the others were to Gokarna and Mangalore for beach parties) and as always it was great fun. 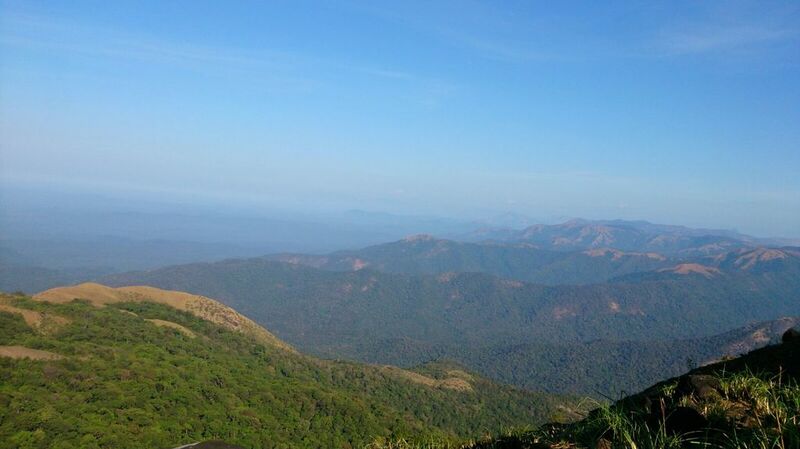 Kumara parvatha is supposed to be the most difficult trek in Karnataka’s and comes to about 30km of trekking. The one advise I have for anyone attempting this trek is that this is not a trek for beginners, do not expect any amenities. It is hard and you need to be the kind of person who appreciates natural beauty to appreciate it. If you haven’t trekked before it is very easy to feel demotivated and put off from the entire concept of Trekking. Basically don’t expect Changing room, rest room, bedroom, shower, porters etc on this trek. 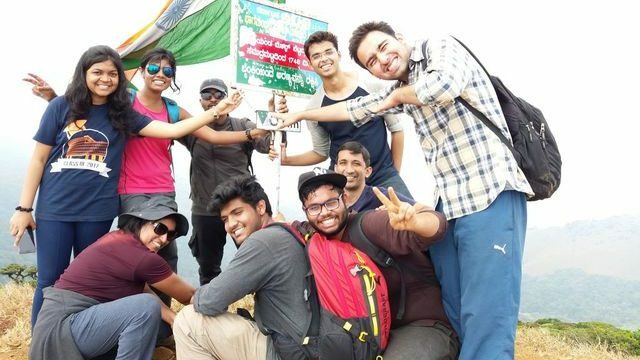 Unfortunately there were some folks in the group who didn’t do their research and for some reason decided to come for the trek without any preparation or research on what to expect. For the most part everyone took it in stride and chalked it up to a good learning experience, however there were some folks (and I am not going to name names as that is not the point of this post) who decided to blame everyone except themselves for their lack of preparation which caused some issues later in the trek and post completion. 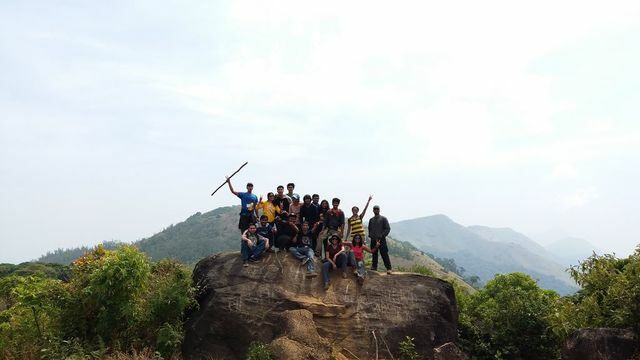 We started the Trek with 21 people from Bangalore via KSRTC bus and from the start itself the trip was quite eventful. We had our first casualty (one of the girls fell and hurt her knee) even before we boarded the bus and one of the guys lost his phone. When we called the number the person who found the phone picked up our call and asked for the pin to unlock the phone, when we refused for obvious reasons he told us that he had no intention of returning the phone. Thankfully it wasn’t an expensive phone but still, it was disappointing. We got to Kukke Subramanya at ~5am after an uneventful drive and freshened up over there before starting the trek at ~8am. The morning was brisk but within a few mins of walking I was dripping in sweat and ready for a halt :). 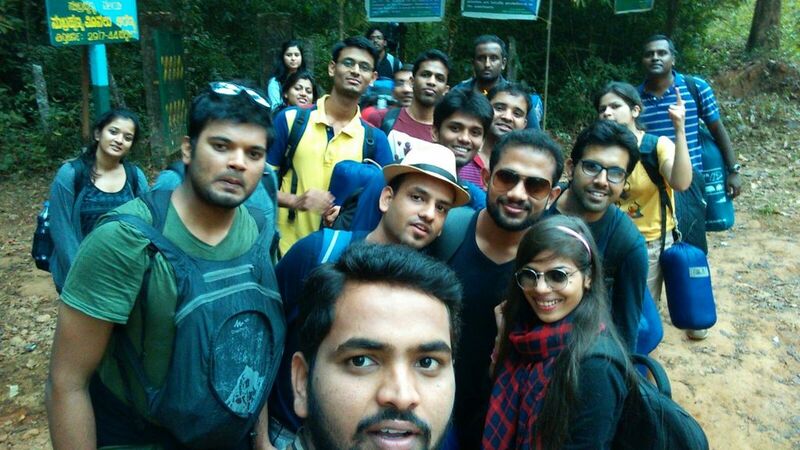 We managed to walk for a whole 10 mins before we took our first halt which set the trend for the rest of the trek. We made it to Battara mane by ~11am. This was after we stopped quite frequently for rest and spent a good 20 mins or so at a stream we found mid-way to recover. 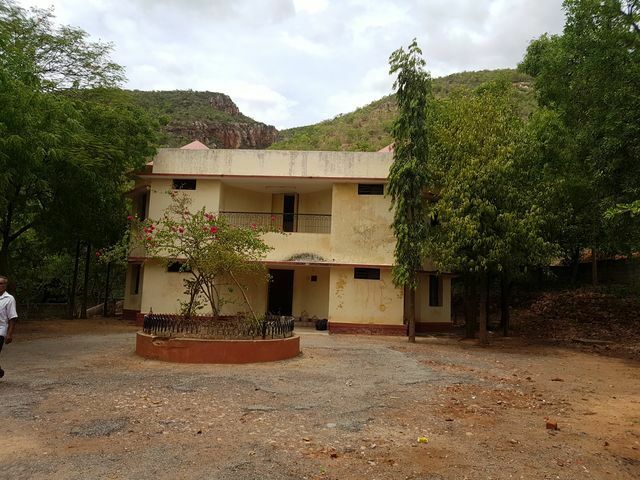 Battara mane which translates to Battara’s house is ~7kms from the beginning of the trek and is the midpoint of the route. For the most part the trail was in the forest so the sun wasn’t a big problem but the last kilometer or so was in grassland so it was burning hot and exhausting. 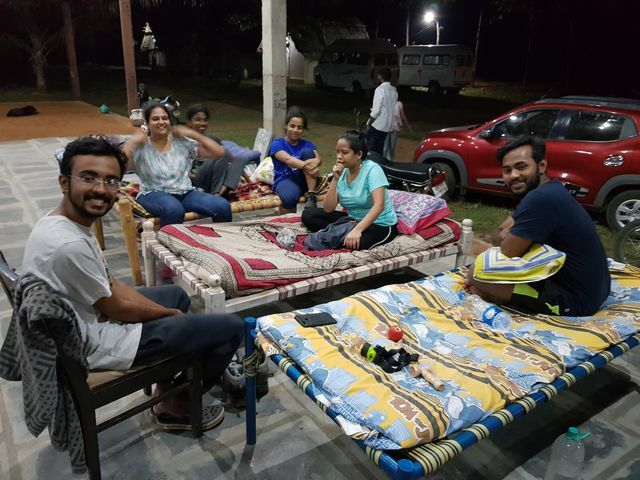 Initially we had planned to continue to KP after a brief rest and food but we were told that camping on KP is banned due to a recent forest fire caused by Trekkers. 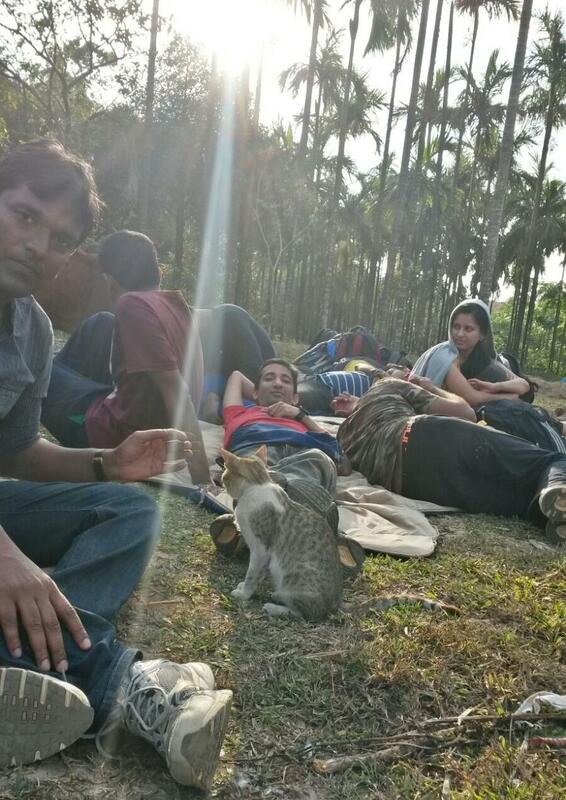 So we decided to camp at the Forest department’s camping site about half a kilometer from Battara’s house. Which honestly speaking was a great stroke of luck because I don’t think a lot of the group would have made it that far and considering the amount of fuss that was raised about the conditions over here I shudder to think how folks would have reacted when they were told that there are not bathrooms/food areas at KP. We had lunch at Battara’s and that was one of the more disappointing parts of the trek as the food was not that great. I had read online that it was very simple south Indian food but that doesn’t cover it. The food was bad. You pay 100 Rs for Rice and Sambhar which was more like Rice and Rasam because I didn’t really see any vegetables in it. Oh and you also got pickle :). The food is self service with no utensils like spoons provided so you get to eat with you hand. I saw a bunch of foreigners trying their hand at it and they enjoyed it. However if you are able to you should carry your own food as you can’t really have the food provided multiple times. We got to enjoy it 3 times and that was more than enough. For dinner you should ensure you are there early because at times you can have a shortage of plates and have to wait. In our group folks made do with 6-8 people eating from a single plate and it was hilarious. After lunch we rested for a bit and then walked over to the Forest departments camp site where we proceeded to try putting up our tents. Interestingly only two of us had ever set up a tent before and it took a group effort with 10-12 people helping over an hour and half to get the first one setup. A few folks figured it was more important to sleep than help us setup the tents but in the end I think we were better off with them not helping. Though I did hear a few complaints from those folks later in the evening about how disorganized the event was and how no one knew how to setup tents etc. After the tents were finally up we checked out the nearby View point and got some amazing pics (see below). This time I spent a lot less time taking photos & more time enjoying the view and the company. I will share more photos once I receive them from the folks brave enough to carry a DSLR on the trek. 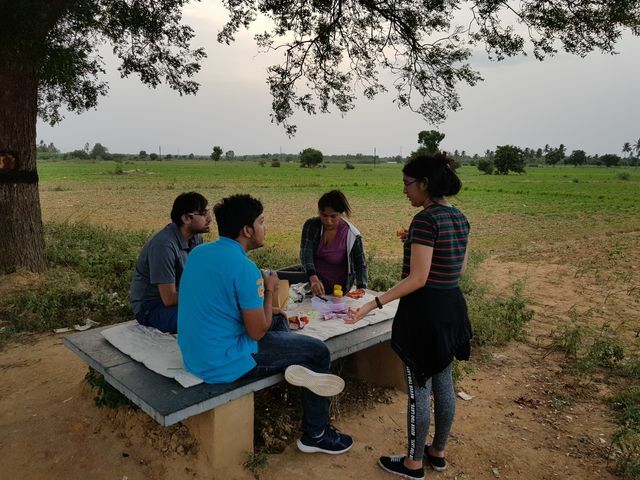 Once it got dark we started a campfire and played a few rounds of antakshari with a couple of interruptions by cattle who wanted to stop by to say hello and try to eat any food items left unattended. By 10 we were ready to crash. Some of the folks felt that the view of the night sky was awesome enough that they decided to sleep outside. This turned out to be an eventful decision as they were woken up by cows a few times when the cows tried to eat their hair. We woke up at 4:30am the next day as we wanted to start the next stage of the trek by 5:30am. Taking down the tents in absolute dark using flashlight was an interesting experience but with the help of most of the people we got it done fairly quickly and were ready to start on the remaining part of the trek. 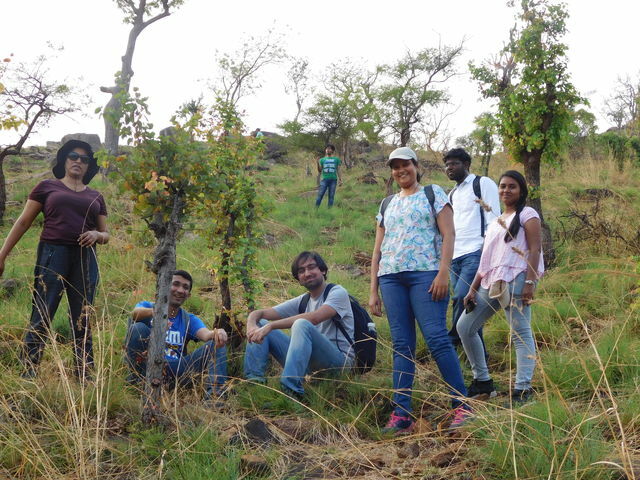 At this time 8 people decided that they did not have the capacity to complete the trek and wanted out. So they declined to continue and went back down the trail. Unfortunately they also declined to carry their sleeping bags/tent back down so we had no option but to carry them down ourselves. We stored our tents/equipment etc at the forest department and started the trek with just food and water. Unfortunately by the time we got to Kallumantapa three of us out of the 13 remaining were not feeling well enough to continue so with a disappointed heart we came back down leaving the last 10 members of the group to finish the trek. After we got back I slept for a bit waiting for the remainder of the group to get back while the other two went ahead down the trail to try to catch an earlier bus back. Once the remainder of our got back from conquering the peak and recovered we had lunch and started back. At this time since the earlier folks had not taken any of their sleeping bags etc with them we were left with 11 people to carry 15 sleeping bags, 6 tents and all our personal bags. Obviously this was quite painful and by the time we got down my knees were on strike and it took us long enough that we finished the last 30 mins of the trek in the dark using flashlights. 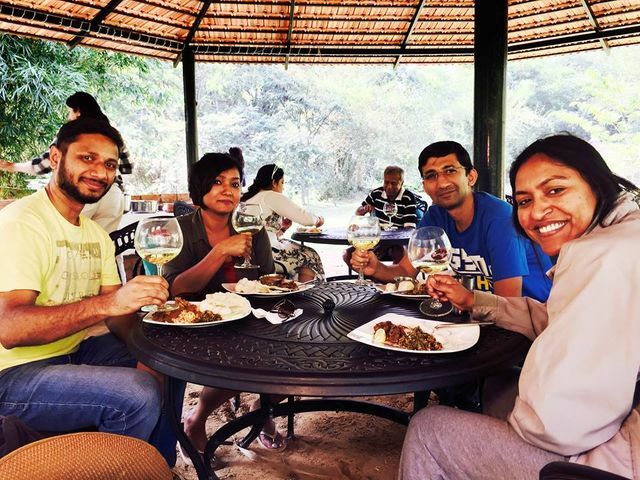 Once we got out from the trail we dragged ourselves to the lodge and got a room to freshen up post which I was feeling human enough to get dinner which was finally something other than rice and sambhar. At 9:30pm we boarded our bus back and reached Bangalore at 4:30am. At which time we found out that due to the last min confusion on who was carrying what we managed to loose one of the tents. Which was a brief downer but still, stuff happens in trips so it wasn’t too bad. Got home at 5:30 and crashed like a log. Even though I didn’t get to finish the trek it felt great pushing my limits and I am def planning on doing this again in the near future so that I can say that I completed KP.